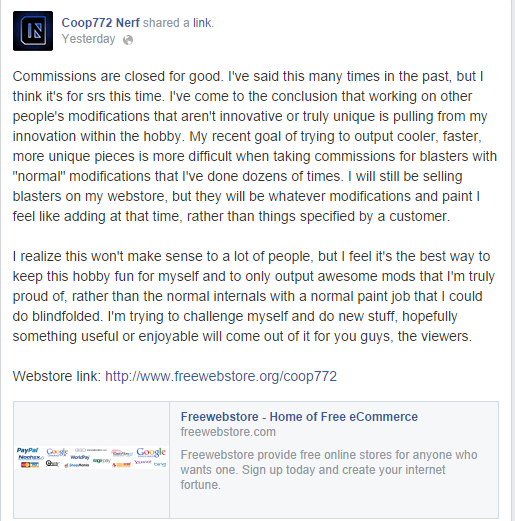 Yesterday, Nerf Youtber Coop772 took to Facebook to announce his closing of commissions. Commissions are closed for good. I’ve said this many times in the past, but I think it’s for srs(serious) this time. I’ve come to the conclusion that working on other people’s modifications that aren’t innovative or truly unique is pulling from my innovation within the hobby. My recent goal of trying to output cooler, faster, more unique pieces is more difficult when taking commissions for blasters with “normal” modifications that I’ve done dozens of times. I will still be selling blasters on my webstore, but they will be whatever modifications and paint I feel like adding at that time, rather than things specified by a customer. I realize this won’t make sense to a lot of people, but I feel it’s the best way to keep this hobby fun for myself and to only output awesome mods that I’m truly proud of, rather than the normal internals with a normal paint job that I could do blindfolded. I’m trying to challenge myself and do new stuff, hopefully something useful or enjoyable will come out of it for you guys, the viewers. While commissions can be a good way to make money, it can be draining on your mental and physical as well. At the end of this statement, Coopy says he’s “trying to challenge myself and do new stuff”. So it looks like he’s aiming for the long run enjoyment in Nerf.